KITESURFING SRI LANKA: First time Land Boarding! Land Boarding is a bit more extreme than kiteboarding because when you fall you really fall hard! 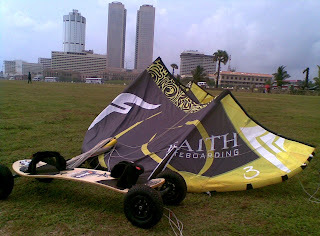 Tried it out for the first in time in Sri Lanka on the Galle Face Green. Not many people today so the area was clear to launch, land (and crash) the kite. Land Boarding has not been experimented much with in Sunny Sri Lanka. Wide Beaches and Barren Dessert Lands with Strong wind yet to be discovered for this sport. More infor about the Land Boarding discoveries to follow soon. How was it? I mean how fast did you travel?